Immersions are new Wanderlust offerings that allow you to deep dive into your practice and learn in a small-group setting from world-renowned teachers. Imagine getting up close and personal with your favorite yoga teacher or wellness leader: You’d learn hands-on, meet like-minded community, and walk away with an unforgettable story of interacting with a world-renowned voice. Wanderlust has long been a hub of wellness leaders—and in 2019, for the first time, we’re giving you that chance to deep-dive with those favorite leaders. Immersions provide you with a close look at the subjects that matter most, from yoga and meditation to fitness and nutrition to personal development and beyond. From pioneers in the yoga community to international best-selling authors and beyond, spend time learning from the experts. Free from distractions, you’ll connect with world-renowned instructors and put your learnings to practice, all in one memorable day. Offerings vary by location and are artfully attuned to the culture and surroundings of each location to ensure you enjoy the perfect setting for steeping in knowledge. First up: Wanderlust O’ahu. All Immersions happen on Thursday, February 28. Here’s what you can expect—don’t miss out! Tickets are going fast. Spend the day with the worldwide best-selling author of ‘Eat, Pray, Love’ and ‘Big Magic: Creative Living Beyond Fear’ for a unique personal development immersion. Elizabeth Gilbert will be talking about what she considers to be the 5 major necessary emotional components of living a creative life: Courage, Enchantment, Permission, Persistence and Trust, and guiding participants through writing exercises and other creative expression. Read about the basics of Elizabeth Gilbert’s Big Magic here. Yoga meets reverence for nature. 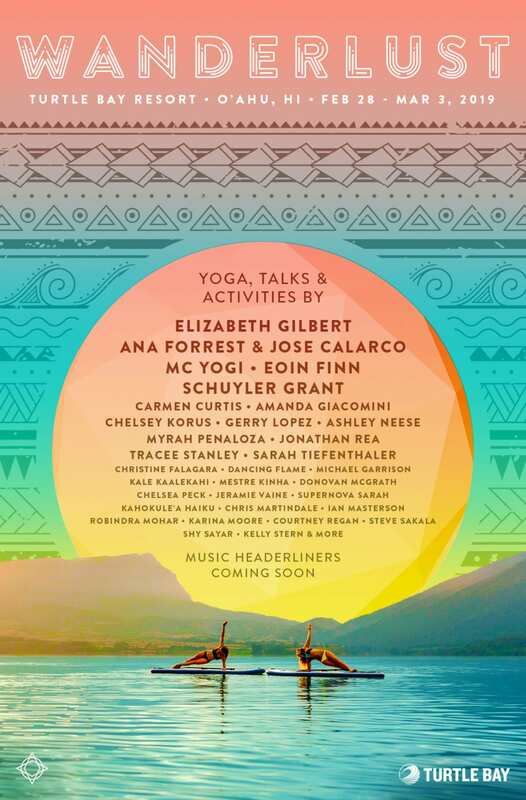 Start the day with a discussion about connecting the teachings of yoga with ecology, put those learnings into practice on your mat, and then join the Sustainable Coastlines crew as we show the Kahuku Coastline aloha by removing as much plastic pollution as we can. Be inspired by legend Eoin Finn with these shareable quotes. Expand your practice. Led by master yoga teacher Ana Forrest and medicine man Jose Calarco, this workshop will explore yoga practices to place you in harmony with all things—not only physically, but also with your feelings and inner wilderness. Students will learn to open their receptors to perceive beauty and to think and act on it. This workshop begins with a short, yet very special ceremony of song, invocation & smoke blessing. Learn about the fierce face of Forrest Yoga here. Get your hands dirty learning how to grow clean food. This is an immersion for you to enjoy and embrace an authentic Hawaiian farm experience, created especially for the Wanderlust ‘Ohana. Off the beaten path and into the back roads of Waimanalo, you will enjoy a full day under the majestic Koolau mountain range on a small organic farm operated by Wanderlust Yoga teacher & musician, Kelly Stern and Paul Izak. Read about the unexpected lessons of farming for fun here. Prices vary by option. Note that the addition of an Immersion is included in a ticket reservation for all Passport holders! For little more than the price of a festival ticket, purchase a Passport and gain entry to 60+ events in 20+ cities around the world. For more information, click here. See you on the North Shore!